Here are some snazzy birthday facts about 29th of August 1969 that no one tells you about. Don’t wait a minute longer and jump in using the content links below. Average read time of 10 minutes. Enjoy! What day was my birthday Aug 29, 1969? August 29, 1969 was a Friday and it was the 241st day of the year 1969. It was the 35th Friday of that year. The next time you can reuse your old 1969 calendar will be in 2025. Both calendars will be exactly the same! This is assuming you are not interested in the dates for Easter and other irregular holidays that are based on a lunisolar calendar. What day is August 29 this year? There are 131 days left before your next birthday. You will be 50 years old when that day comes. There have been 18,131 days from the day you were born up to today. If you’ve been sleeping 8 hours daily since birth, then you have slept a total of 6,044 days or 16.55 years. You spent 33% of your life sleeping. Since night and day always follow each other, there were precisely 614 full moons after you were born up to this day. How many of them did you see? The next full moon that you can see will be on May 18 at 21:13:00 GMT – Saturday. Fun stat: Your first one billion seconds (1,000,000,000) happened sometime on May 7, 2001. If a dog named Ubbzy - a Alaskan Malamute breed, was born on the same date as you then it will be 272 dog years old today. A dog’s first human year is equal to 15 dog years. Dogs age differently depending on breed and size. When you reach the age of 6 Ubbzy will be 45 dog years old. From that point forward a large-sized dog like Ubbzy will age 5-6 dog years for every human year. View the complete list of August 29 celebrity birthdays. Who are the famous August 29 birthdays? Here’s a short list of famous people in history who were born on Aug 29. View the complete list of August 29 famous birthdays. What happened on my birthday – Aug 29th? Pope Urban IV succeeds Pope Alexander IV as the 182nd pope. The Treaty of Picquigny ends a brief war between the kingdoms of France and England. The city of Nuuk in Greenland is founded as the fort of Godt-Haab by the royal governor Claus Paarss. Frederick the Great attacks Saxony, beginning the Seven Years’ War. American Revolutionary War: British and American forces battle indecisively at the Battle of Rhode Island. The Mount Washington Cog Railway opens, making it the world’s first mountain-climbing rack railway. Emperor Meiji orders the abolition of the han system and the establishment of prefectures as local centers of administration. (Traditional Japanese date: July 14, 1871). US Navy salvage divers raise USS F-4, the first U.S. submarine sunk in an accident. United States Air Force Academy opens in Colorado Springs, Colorado. Leading Egyptian thinker Sayyid Qutb is executed for plotting the assassination of President Gamal Abdel Nasser. View the complete list of August 29 historical events. What does my birthday August 29, 1969 mean? 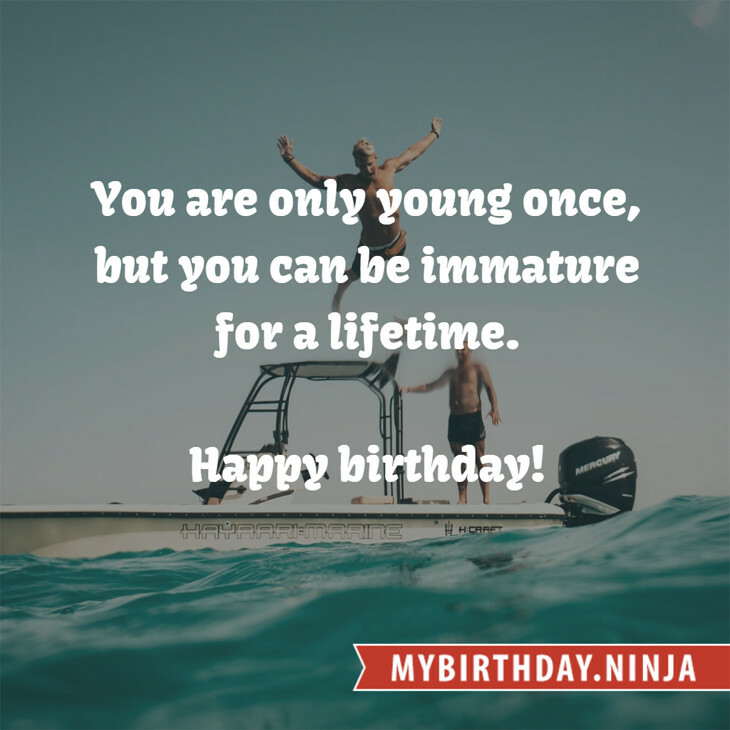 Your birthday numbers 8, 29, and 1969 reveal that your Life Path number is 8. It represents experience, authority and endeavour. You are gifted with natural leadership and the capacity to accumulate great wealth. The following celebrities also have the same life path number: Maricel Laxa, Sarah Polley, Karla Álvarez, Andrew Gold, Anthony Andrews, Chris Pitman, Dieter Meier, Lee Ranaldo, Vice Cooler, Katia Cardenal. 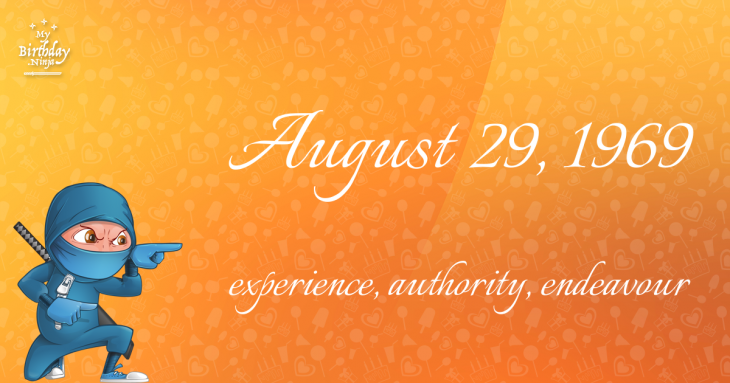 What is the birthday horoscope for Aug 29, 1969? The Western zodiac or sun sign of a person born on August 29 is Virgo ♍ (The Maiden) – a mutable sign with Earth as Western element. The ruling planet is Mercury – the planet of communication. According to the ancient art of Chinese astrology (or Eastern zodiac), Rooster is the mythical animal and Earth is the Eastern element of a person born on August 29, 1969. What is the birthstone for August 29? Peridot is the modern birthstone for the month of August while Diamond is the mystical birth stone (based on Tibetan origin). The zodiac gemstone for Virgo is carnelian. Lastly, the birthday stone for the day of the week ‘Friday’ is emerald. Fun fact: The birth flower for 29th August 1969 is Poppy for preparedness. What is the Love Match for Aug 29, 1969? When it comes to love and relationship, you are most compatible with a person born on February 5, 1997. You have a Love Match compatibility score of +146. Imagine being in love with your soul mate. On the negative side, you are most incompatible with a person born on February 19, 1948. Your incompatibility score is -128. You’ll be like a cat and a dog on a love-hate relationship. Arf-arf, I want to bite you. Meow-meow, stay away from me! What is a good birthday trivia for August 29? The number-one hit song in the U.S. at the day of your birth was Honky Tonk Women by The Rolling Stones as compiled by Billboard Hot 100 (August 30, 1969). Ask your parents if they know this popular song. How many babies were born on August 29, 1969? Base on the data published by the United Nations Population Division, an estimated 120,942,839 babies were born throughout the world in the year 1969. The estimated number of babies born on 29th August 1969 is 331,350. That’s equivalent to 230 babies every minute. Try to imagine if all of them are crying at the same time. What is the popular baby name on 29 Aug 1969? What’s your bizarre Florida Man story? The #FloridaManChallenge is breaking the Internet and social media. Some crazy men, women, or creatures from the Sunshine State are making headlines every day of the year including your birthday. Try this fun exercise. Pick your search engine of choice and type in “florida man August 29” and see what kind of wild news headline you will get. This viral craze started in 2013 and gets resurrected now and then. The latest was from Tumblr and found its way to Twitter. As they say, the rest is history. Here’s a quick list of all the fun birthday facts about August 29, 1969. Celebrities, famous birthdays, historical events, and past life were excluded. Try another birth date of someone you know or try the birthday of these celebrities: April 25, 1953 – Ron Clements, American animator, producer, and screenwriter; October 8, 1950 – Robert "Kool" Bell, American singer-songwriter and bass player (Kool & the Gang); August 11, 1972 – Jonathon Prandi, American model and actor.